I’ve always had a soft spot for classic American desserts. Rich creamy puddings. Tall layer cakes. Fruit filled cobblers with nubby sugary toppings. And especially, upside down cakes, moist and buttery topped with darkly caramelized fruit. I’m fond of various fruits in this manner – plums, apples, apricots – but that 1930’s and quintessential American classic – pineapple – has always been a favorite. I can’t remember what spurred my desire to make a pineapple upside down cake other than I haven’t made one in quite a while. No time like the present to dust off the recipe card. I came across a version of this recipe in culinary school and have tweeked it over the years to just the way I like it. The cake is tender and full of flavor but who are we kidding? It’s the caramelized fruit topping that is really the most important part. It starts with a dark brown sugar pan spread, spiked with a bit of rum, that seeps into the pineapple slices and bottom of the cake during baking, creating a dark, sweet, gooey caramelized topping. Never one to encourage a brightly dyed maraschino, I much prefer to plump dried sour cherries in jigger of dark rum, placing those instead in the center of each pineapple ring. I also don’t mind canned pineapple. Not in the least. While I have used a fresh pineapple several times, it seems more in the spirit of this classic dish to pop the top on a can. It’s easy, the fruit is consistent in size and flavor and besides, finding a consistently good fresh one is often a treasure hunt I’m not usually in the mood for. There’s a little special trick I use at the end to add a bit of extra flavor. Take the reserved pineapple juice from the can and reduce it down to a thick syrup with some sugar and a little more rum. Brushed and dabbed on the top it serves a bevy of purposes – added flavor, extra moisture, creates a nice seal and makes the whole cake shiny and pretty. STRESS BAKING THERAPY FACTOR: I mean this in the best possible way but this cake always makes me want to put on a ruffled apron and mix up a shaker of martinis. It’s an old recipe, one you don’t see much anymore and I think we need to bring it back. Something this good shouldn’t be pushed into the background. Preheat the oven to 375°F. Spray a 10” cake pan with pan spray and set aside until needed. Soak the cherries: Place the dried cherries in a small bowl. Heat the rum in a small saucepan until hot and pour over the dried cherries. Cover tightly with plastic wrap and let the cherries soak at least 30 minutes while you prepare the cake batter. For the caramel pan spread: In a medium bowl, combine both sugars, rum, corn syrup, salt and melted butter. Spread evenly in the bottom of the prepared pan. 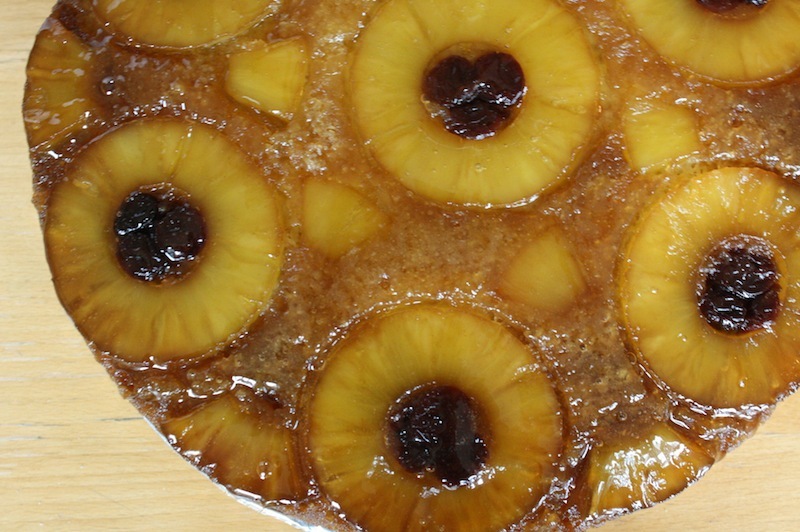 Drain the pineapple, reserving the juice for the glaze, and arrange the slices decoratively on top of the pan spread. If desired, fill the empty spaces with smaller bits of pineapple. Place 2-3 soaked dried cherries in the center of each pineapple slice. Set the pan aside. For the cake: Sift the flour, baking powder, baking soda and salt together and set aside until needed. In the bowl of a standing mixer fitted with the paddle attachment, cream the butter and sugar until fluffy and pale, about 5-8 minutes. On medium-low speed, add the eggs/yolks one at a time, scraping the bowl between additions. Add the vanilla and rum. On medium-low, add the sifted dry ingredients in three additions with the sour cream in two additions in between. Scrape the bowl. Spread the cake batter evenly in the pan, taking care not to dislodge the pineapple. Bake for 55-60 minutes until golden brown and a toothpick inserted just off center comes out clean with moist crumbs. 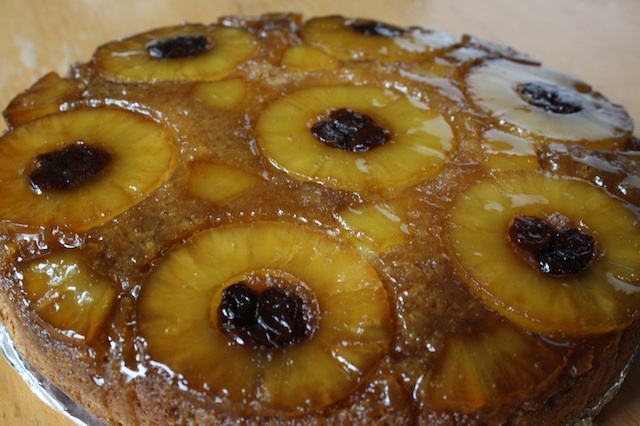 Let the pan cool on a wire rack for 5 minutes then turn out onto a cake platter, nudging the pineapple back into place if necessary. Don’t let the cake cool for too long in the pan or the caramelized sugar will harden. If this happens, put the pan on a burner over medium-high for a moment or two to rewarm the sugar. For the glaze: in a small saucepan, bring the reserved pineapple juice, rum and sugar to a boil, then reduce the heat to medium and reduce by half until thick and syrupy. Brush the syrup over the top of the cake, coating the fruit well, gently dabbing where needed. My mother didn’t bake much, but she sure made a great pineapple upside down cake. Unfortunately, she didn’t have the recipe written down, Your recipe looks great. Perhaps I’ll give it a try this Easter.